Body Sense 15 HOW CAN MASSAGE HELP? While fibromyalgia forced Floyd to quit working for a few years, she now uses massage to help manage her symptoms. "When I am really hurting, I get an hour massage every week and as I improve, I get one a month to maintain." For those who suffer from fibromyalgia, receiving massage or bodywork might seem like the last thing you'd look to for relief when even the thought of being touched creates stress. 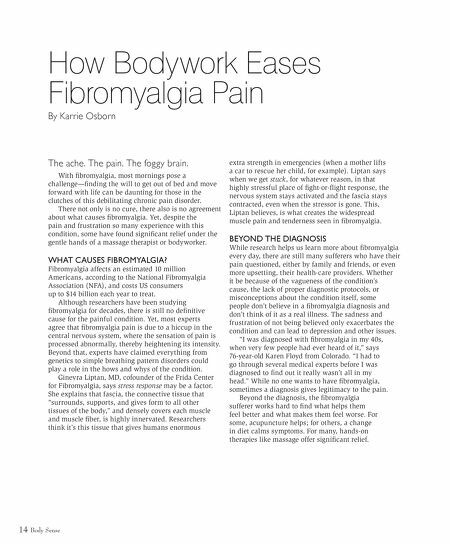 But working your soft tissues is actually the way to address the tightened fascia that Liptan thinks is such a critical piece of the fibromyalgia puzzle. The caveat here is the kind of therapeutic touch clients choose to receive. While it might sound tempting to some, fibromyalgia sufferers should not seek out deep massage work, as this can trigger the nervous system and cause a flare- up of symptoms. Gentle, slow, sustained pressure is the key, and there are a variety of hands-on modalities that can help. The goal is to calm the sympathetic nervous system and let those contracted tissues break out of their stressed state. Fibromyalgia sufferers turn to a variety of techniques and therapies to ease their aches and pains. Ultimately, finding the right combination involves personal choice and experience. 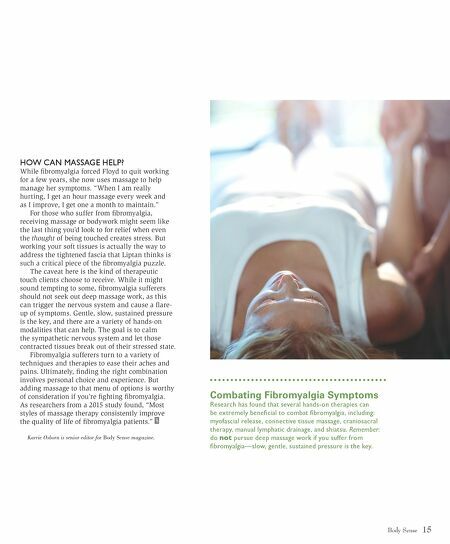 But adding massage to that menu of options is worthy of consideration if you're fighting fibromyalgia. As researchers from a 2015 study found, "Most styles of massage therapy consistently improve the quality of life of fibromyalgia patients." B S Karrie Osborn is senior editor for Body Sense magazine. Combating Fibromyalgia Symptoms Research has found that several hands-on therapies can be extremely beneficial to combat fibromyalgia, including: myofascial release, connective tissue massage, craniosacral therapy, manual lymphatic drainage, and shiatsu. Remember: do not pursue deep massage work if you suffer from fibromyalgia—slow, gentle, sustained pressure is the key. Find the Right Massage & Bodywork Therapies for You!